The 3 Trunk Common Ringer Matrix allows connecting multiple Central Office (CO) lines to one common output whenever one of the lines rings. This unit eliminates the necessity of providing a separate bell for each incoming CO line. The Model 173W will accommodate three CO lines or Analog Terminal Adapter (ATA) pairs. For more than 3 lines you can gang 173Ws together. The unit also functions as a Ringing Detector. 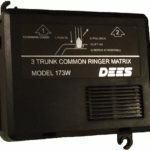 The 173W unit is very easy to install. Screw terminals allow simple bridge tap connections to the incoming CO lines. No external power or grounding is required. The output will drive practically any common audible device (ringer). The wiring diagram is printed inside the housing for convenience. The 173W provides a choice of two outputs: standard ringing voltage or dry contact closure. Also, multiple 173W outputs are easily daisy-chained to expand beyond three CO lines. The perfect solution for organizations that require common audible or night bells. Economize on the cost of installing one bell for each line. The Model 173W allows you to connect all your lines to one bell. Make sure calls are heard when your receptionist goes home. In loud industrial areas, combine with Dees’ Model 196 Loud Industrial Ringer. Use the dry relay contacts to operate auxiliary equipment. For example, through the use of a power supply connected through the optional contact closure, you can drive a 24 VDC lamp. This application would be suitable for locations that require visible rather than audible notification of a call, such as recording studios, nurses stations, or the hard of hearing. The diagram below shows two Model 173W daisy-chained to allow one bell to ring on up to six lines.